Sagittarius New Moon December 3, 2013, Beijing, China. The first CPC Central Committee Plenary Session was held on December 11, 1978 two years after Mao's death. This was seen as an Opening-Up of China. These Sessions generally focus on economics, however this conference also focused on many other social issues which was very exceptional considering China's past development and governmental structure! From an astrological prospective the planetary correlations' are very interesting!! Making use of the new chart ( Li Zhisui) it appears that Saturn is making its presence known. Using the whole sign house system, Saturn is transiting through China's first house, although it will not cross the Ascendant until November 2014. However it will Station (23° 19' Scorpio) retrograde extremely close to the new rising Time (24° 47' Scorpio) on March 1, 2014. Saturn's position in the December 2013, new moon lunation chart is 17°21' Scorpio and making a direct partile square to natal Pluto/Mars (Leo) in the 10th Mundane whole sign house. The 10th house Pluto/Mars natal aspect in the fixed sign of Leo can be seen as a Forced-Control and at times brutal ruling Power. The sign (Image, Lion) Leo is ruled by the Sun, which in China's natal chart is in the Mundane 12th house in the sign of Libra @ 07°34'. This natal Sun (Leader) has been undergoing a transformation, as transiting Uranus (Aries 8°) is making several pass's directly opposing this natal position. The new chart as mentioned places the Sun in the 12th, which makes sense when we consider the past history of Chinas' first leader Mao Tse-Tung. This current Uranus/Sun oppositions should arouse the inner or core subconscious to promote a revolution thought process. Furthermore when we take the chart as a whole transiting Jupiter (Cancer) is moving through the natal 9th house and is directly opposing natal Jupiter (Capricorn) in the 3rd mundane house. Jupiter rules the natal 2nd and also co/rules (Neptune/Jupiter-Pisces) the natal 5th house. So philosophical and factual thoughts directed towards new and innovative reform of the old structures, which includes the 5th house affairs (Children, birth rate, school system and education in general) can be assumed to make the headlines. Announced at the Third Plenary Session is, China will loosen its decades old one-child population policy, allowing couples to have two children if one of them is an only child. The latest or current headlines spell this out further, with natal Uranus (Cancer) placed in the natal 9th house and transiting Uranus moving through the natal 6th (Mundane; defence, armed forces, civil service) house. China's defence ministry announced recently a new "East China Sea Air Defence Identification Zone" that covers the airspace of uninhabited islands. These Island's called Diaoyu by the Chinese and Senkaku by the Japanese are at the centre in the dispute with Japan. 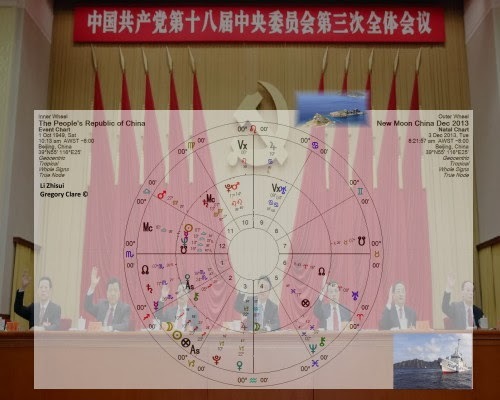 Many more correlation can be sighted from the coming new Moon lunation and as mentioned it will be very interesting to observe the way in which the new leadership deals with the many issues pending China's fate.